Posted on Sat, Mar 10, 2012 : 4:16 p.m. Flu is on the rise in Washtenaw County this month, although overall it’s been a mild influenza season, Washtenaw County health officials said. Four people were hospitalized for influenza last week and at least one this week, said Laura Bauman, epidemiologist for the Washtenaw County Public Health Department. Twenty people were reported ill from the disease last week, she said. A flu shot is the best defense against influenza. 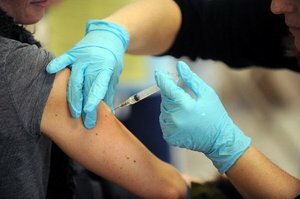 Three different strains of influenza, A/H3, A/H1N1, and B are circulating in Washtenaw County, health officials said. The first influenza hospitalization this year was reported on Feb. 1. Bauman said there has also recently been a spike in upper respiratory infections among children at local schools and child-care centers. At St. Joseph Mercy Hospital in Superior Township, the hospital’s emergency room has seen a recent uptick in cases of upper respiratory infections but the hospital has not seen an increase in the number in flu cases, said hospital spokeswoman Lauren Jones. University of Michigan Health System officials were not available for comment Friday afternoon. Frequent hand-washing and avoiding touching your eyes, nose and mouth can also help you avoid the flu and spreading it to others if you have it. We have that respiratory thing going on here, but not the flu, thank goodness. Hope everyone heals quickly! Sun, Mar 11, 2012 : 9:27 a.m.
H3N2 is not covered by the flu shot. Its a novel virus. That is why so many people are getting sick. And it should be clarified by the reporter; the 20 cases of flu are 20 confirmed through testing. That doesn't mean there were only 20 sick people. Not everyone understands that. Sun, Mar 11, 2012 : 3:36 p.m. Sat, Mar 10, 2012 : 9:30 p.m. I wish some people could try harder to cover there mouth when they cough!